The Eighteenth Judicial District Commission on Judicial Performance unanimously recommends by a vote of 10-0 that Judge Anne M. Ollada BE RETAINED. Judge Ollada was appointed to the Arapahoe County Court in September 2006. From 1999 until her appointment to the court, she served as a magistrate in the 18th Judicial District. Prior to her judicial duties, Judge Ollada was in private practice as a civil attorney. Judge Ollada completed her undergraduate work at the University of California at Santa Barbara where she majored in Chinese studies. She received her law degree from the California Western School of Law in San Diego, California in 1992. Judge Ollada currently serves on the Statewide Interpreter Oversight Committee and the Judicial Conference Planning Committee. She teaches classes to interpreters and has acted as a coordinator, moderator and instructor for the Judicial Conference. Judge Ollada is also very active in the community, speaking to numerous schools about her role as a judge and the law. She works with Arapahoe High School’s law class and presides over their mock trials. Judge Ollada presided over civil cases July 2012-October 2014, and her current workload is split between traffic and misdemeanor cases. Before recommending the retention of Judge Ollada, the Commission conducted extensive research, including a personal interview with Judge Ollada, reviewing opinions Judge Ollada authored, observing her in court, reviewing surveys sent to attorneys and non-attorneys, studying Judge Ollada’s personal self-evaluation, and engaging in meetings to analyze Judge Ollada’s performance -- including meetings with Public Defenders and District Attorneys. Of the small sample of 30 attorneys who completed the surveys with knowledge of Judge Ollada’s performance, 56% recommended that she be retained on the bench, 37% recommended that she not be retained and 7% made no recommendation. Of the 77 non-attorneys who completed to the survey, 95% recommended that she be retained, 2% recommended that she not be retained and 3% made no recommendation. Judge Ollada’s attorney survey scores were concerning. The Commission saw that she received ratings below the average of other county court judges standing for retention in case management, application and knowledge of law, communications and demeanor. However, she also received positive comments on being hard-working, being prepared to hear the cases before her, and exhibiting familiarity with the issues and the law at the time hearings begin. She was also praised for providing clear direction and instructions to the jury. In addition, both the Public Defenders and District Attorneys had positive things to say about her abilities as a judge. 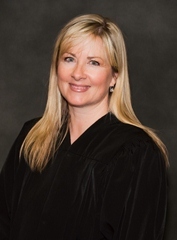 Judge Ollada has proactively addressed reported weaknesses in her performance, including seeking assistance of a more experienced mentor judge within her district, requesting other judges to observe and comment on her demeanor in court, and opening lines of communication with attorneys who may appear before her. The Commission acknowledges and applauds these active efforts and recommends that Judge Ollada continue her voluntary performance plan and that she be retained.